Check out the Remington Virtually Indestructible Barbershop Haircut Kit. 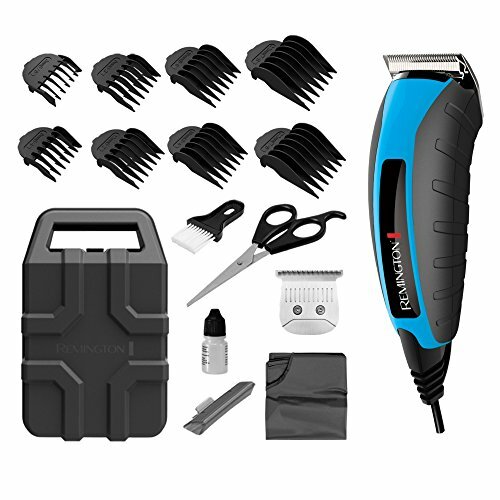 Best For: People who want a tough, rugged hair clipper that could withstand drops, knocks, harsh conditions and still achieve a professional looking cut. 2 What Comes In The Box? a well known worldwide personal care corporation which manufactures razors (shavers), epilators, and haircare products for both men and women. The Remington brand has always been synonymous with good quality hair clippers. They are all very similar in function and performance…. the main difference being the number of accessories that is contained within the kit. The Remington HC5850 Indestructible Barbershop Haircut Kit review below compiled by BestHairClippers.info contains an overview of the good and not so good points about the Remington HC5850 Virtually Indestructible Barbershop Haircut Kit together with a summary of the collection of reviews by current users of this particular type of hair clipper. You will if you have been following our hair clippers reviews blog note that all our product reviews are quite detailed and cover all the important features and aspects of the product. The kit is a 15-piece complete high performance hair cutting kit. It comes with everything you need to achieve a successful professional haircut at home plus a premium storage case to keep all your hair cutting kit together. Watch the clip below to see the unboxing of the Remington #HC5850 Barbershop Haircut kit. The Remington Virtually Indestructible Barbershop Hair Clipper is a small, compact size clipper. It is lightweight, has rubberized grips along the sides, and is truly palm-sized, making it easy to maneuver and hold in a loose grip, even with fingertips, as is often required when clipping one’s own hair. It comes with a 15 piece accessory kit containing a number of plastic guide combs together with other items to help you achieve or give a professional looking cut and also maintain your hair clipper. There is a very small black switch on the bottom left side flush with the body where the cord comes into the clippers. The clippers come in colors; black, yellow and blue… blue being the latest color. Below are some of the key features of the Remington #HC5850 Virtually Indestructible Barbershop Haircut Kit. The Remington HC5850 clipper is a mains operated corded electrical hair clipper. such as the hair clipper running out of battery juice in the middle of a hair cutting session or having the problem of a weak or dead battery. The Remington HC5850 indestructible hair clipper operates at peak performance on a continuous basis as it is connected to the mains electricity supply as opposed to if it was a cordless hair clipper where it starts to lose power as the battery drains down whilst using this corded clippers. The Remington #HC5850 hair clipper is fitted with a powerful but exceptionally quiet magnetic motor which emits little noise or vibration making the hair cutting experience a comfortable one. Hair clippers that are fitted with a magnetic hair clipper motor are usually pretty powerful and fast and the Remington #5850 hair clipper does not disappoint here. The super torque magnetic motor powers the cutting blades for a quick and clean cutting performance. It is fast and able to cut through various types of dry hair with speed. The electromagnetic motors fitted on the Remington Barbershop clipper generate a super-powerful 7,200 blade strokes per minute (SPM) which is the highest of any motor of its type for incredibly smooth cutting. The Remington Virtually Indestructible Barbershop hair clipper does not have an adjustable taper lever. Though it lacks a taper lever on the side for adjusting the hair length settings, you can adjust the size of the haircut length you leave behind by either swapping out the blades of the clipper or use guide combs to achieve varied length settings. Being able to achieve various hair length settings with your hair clipper means you can achieve more detailed work and styling. This a great bonus as most home hair clippers only enable you to use clipper guides to achieve varied length settings. This is especially helpful if you want to be able to achieve a tapered look for necklines, or if you want to create fades or blending between sections. In terms of the detachable blade system, all you need to do is remove and change the blades to achieve different length settings or even change the blade and use a hair clipper guide in addition to achieve a convenient hair length setting. The blades on the Remington Indestructible Barbershop clipper can be swapped out for other blade types and sizes like the Remington Balder Blade or the Remington T-Blade. Using the Remington balder blade for example with the Remington Barbershop Clipper will help you achieve a trim of 0.40 mm enabling you to create a dapper bald look quickly and easily. The process for removing and changing the blade system is also quite simple. There is some downside to the Remington Barbershop clipper using a detachable blade system as opposed to an adjustable lever system. 1) There is some loss of time involved in changing from one blade to another… its not as fast as using an adjustable lever. 2) The lack of an adjustable lever means you cannot effect minute but precise adjustments to your desired hair cut length, which you might want to do for example when doing fades. 4) The issue of availability of blades that fit this particular model of hair clipper. Not a lot of 3rd party manufacturers produce blades that will fit this particular hair clipper as opposed to something like the Osters Classic 76 hair clippers. Using the hair clipper guides that come with the clipper, you can also easily achieve hair length settings of between 0.5mm (1/32 of an inch) to 25mm (1 inch). The blades fitted on the Remington #RC5850 Indestructible Barbershop hair clippers are the Remington’s standard self sharpening precision ground blade. The fact that they are self-sharpening means that you don’t need to be that concerned with the maintenance of the blades. All you need to do is regularly oil them after each use. The Self-sharpening precision blades on the Remington #HC5850 Barbershop hair clipper are made from stainless steel material which protects the blades from rusting. In terms of performance, self-sharpening precision ground blades tend to be pretty sharp and make light work of the thickest or toughest of hair; delivering effortless cutting performance use after use. The only downside is that the blades are a proprietary product and as such are only manufactured by Remington. The blades can in theory only be obtained from the manufacturer although they are readily available from sites like Amazon. The Remington Virtually Indestructible hair clipper comes fitted with a thick but pliable 8-foot power cord that seems tough enough to last years but also wrapped easily for storage. The Remington HC5850 hair clipper is mains operated and as such, you will not have to worry about re-charging the battery, or having the problem of a weak or dead battery. Some of the new hair clippers on the market are now produced as usable with any worldwide voltage … which is an added benefit … enabling you to take it along with you on holidays to any part of the world. you are most likely going to need a step down transformer together with a plug that will fit the electrical sockets in your country… which of course is an extra expense. If you have no intention of travelling abroad with your hair clipper… the issue of whether it is dual voltage or not should not be an issue for you. The Remington Virtually Indestructible hair clipper is lightweight and small enough to comfortably fit into the palm of your hand. It also comes with a hard premium plastic case which is compact enough to fit in a drawer or on a shelf. The case is fitted with a quality clasp and rigid hinges that allow the case to be sealed correctly. The Remington Virtually Indestructible Barbershop haircut Kit has a useful assortment of combs and accessories to make the hair cutting process at home a success. The Remington Virtually Indestructible Barbershop haircut Kit comes with 8 guide combs to enable you create a wide range of modern looks and traditional styles. The guide comb sizes range from barber grade one (1/8 inch or 3 millimeters) to eight (1 inch or 24 millimeters). The clipper’s guide combs are made of rigid ABS plastic, so they don’t deform and leave track marks or trap and pull out hair when pressed against your head. They attach and seat firmly, unlike some models we tested whose attachments had enough play that they could be put on crooked or pop off altogether. 1. The guide combs included are a little too pointy and sharp, and so, if not angled properly when cutting, it’s easy to jab your scalp. 2. The Remington Barbershop clipper kit also comes with fewer combs than some other clipper brands out there. which are used to simultaneously trim and blend around the ears and which can make cutting this area easier for beginners. Included in the Remington #5850 Hair Clipper kit is also a very solid high quality premium case, that you can take anywhere with you. It is compact enough to fit in a drawer or on a shelf for easy storage. Unlike some home hair clipper kits that are supplied with small pouches or just boxes, this case is made of a good quality plastic material and has a quality clasp and rigid hinges that allow the case to be sealed correctly. The case apart from looking good is also well laid out in a way that it’s easy to fit everything in the kit back into the case (it’s not like it has a specific place and won’t close if it’s not in that place!). In additions to the guide combs and the premium storage case that come in the Remington Virtually Indestructible Hair Clipper kit are a range of items to help you achieve that professional cut at home and also to help maintain your hair clipper in peak performance. Blade Oil – You get a small bottle of blade oil for the clipper – The oil is essential to keep the clipper in top shape. You will need to apply a few drops of the oil when you clean the unit and/or before use… the clipper oil will last you for some time before you need to replace the oil. Hair Clipper Brush – You also get a hair clipper brush to help you remove hair from the clipper and for cleaning the hair clipper. Scissors – Included also is a pair of scissors. This is a very useful addition to the kit. Use & Care Guide – Also enclosed within the kit is a comprehensive and very helpful “Use & Care Guide”. It would have been more helpful to include a hair cutting link to the Remington Site, but as it is, there are already plenty of helpful videos on You Tube. The inclusion of all these items in the kit means you save a great deal of money as you do not have to spend additional money obtaining them… You do all have all you need to give a decent hair cut at home. Remington Hair clippers provide a quick and easy way to create professional looking haircuts. The kit includes everything you need for a great haircut. Developed to combine precision blades with premium guide combs, this Virtually Indestructible hair clipper enables you to achieve customized, modern looks and traditional hairstyles. The durable clipper’s super torque motor powers precision blades for fast and clean cutting performance on any hair type. As for basic hair cutting, the clippers will do the job when used with the other tools in the kit. Anyone who cuts their own hair shouldn’t have any problems using the kit. Below are some of the key performance features of the Remington HC5850 Indestructible Haircut Kit. Unlike most of the hair clippers in the same price range that are of a plastic build which have to be handled with care, the Remington Virtually Indestructible Barbershop Clipper is engineered tough to last a lifetime. The Remington Virtually Indestructible Barbershop Clipper features a high-impact polycarbonate casing to protect its powerful interior. With a tough casing and rubber grip, this clipper will provide years of comfortable, dependable use. A super magnet motor drives maximum power to the precision ground blades for 2x faster cutting performance than Wahl corded clippers, and the exclusive POWERCUT Blade System keeps the blades properly aligned for a smooth, even cut every time. The Remington #HC5850 indestructible clipper has a powerful, but exceptionally quiet motor. A lot of users are taken back on how quiet the Remington Barbershop clipper really is compared to a lot of the hair removal clippers on the market. It’s too quiet to really be cutting hair, right? It is perfect if you have little ones as they are no way as loud as a lot of the hair clippers out there. The Remington Virtually Indestructible Hair clipper is especially suited to people who want to cut their own hair. It cuts easily and consistently. It never misses a spot or slows down. It delivers exactly as promised. It is lightweight, has rubberized grips along the sides, and is truly palm-sized, making it far easier than a lot of other models to maneuver and hold in a loose grip, even with fingertips, as is often required when clipping one’s own hair. It comes with quality, rigid-plastic guide combs that make it easy top achieve various hair length settings. This model also has a thick-but-pliable 8-foot power cord that makes it pretty much easy to maneuver the clipper. The Remington Virtually Indestructible Hair clipper themselves have a very sturdy feeling. They are not too heavy that it’s annoying but it’s heavy enough to feel good and sturdy in your hands. It’s not a slippery feeling at all, so it cannot be easily dropped. You will be able to easily achieve various hair designs and styles with this clippers as it seats comfortably in your hands. The Remington Virtually Indestructible Hair clipper is easy to clean and maintain. All you need to do is brush the accumulated hair from the cutters. The cutting head comes off easily for cleaning, which is pretty convenient. Note that although they say it’s “virtually indestructible”, they also advise you NOT to submerge any of the parts under water. And that includes the cutting blade. In terms of caring for the blades, it is recommended to oil the blades after every use. All you have to do is place 1 to 2 drops of lubricating oil on the moving blade and turn on the clipper. The oil should distribute on its own. …. Then wipe off any excess oils. That’s all there is to it. One of the key things to consider when purchasing a pair of clippers is how easy it will be to replaceable parts of the clipper if things do go wrong and how much the replacement parts cost. You can easily obtain a replacement for the blades as opposed to some for other clipper types as the Remington Brand is quite a popular brand. This is quite true for the clipper guides too! Not only can you get the replacement blade and/or clipper guides from the manufacturer… you can also get them online from shops such as Amazon. Also you can purchase other types of blades such as a T-blade to replace the standard blade on the Remington Barbershop Clipper especially if you are interested in doing detailed work and styling. Remington T blades are for detailed work and styling and they allow for close cutting around the ear, in the back, and around facial hair without accidentally nicking an ear or creating a bald patch. For those looking to achieve a bald look, Remington also produces a balding blade which fits this particular hair clipper. The Remington balding fade will help you achieve a trim of 0.40 mm enabling you to create a dapper bald look quickly and easily. The process for removing and changing the blades and guides is also quite simple and easy with this particular hair clipper. Very quiet, doesn’t get hot. Case it comes with is excellent, as well as the brush for cleaning. Holding out one star because the attachments could be a little more skin-friendly for a smooth ride. Otherwise fantastic. Nice clippers – good weight to the clipper and blades work well with the guards on. You may need another clipper for around the ears and neck. Has a nice zippered black case that comes with it that I can throw everything in when done. These are everything they are advertised to be. I only use them as a beard grooming tool and they are perfect for the job. Lots of accessories were provided to meet most any need. The Remington Virtually Indestructible Barbershop Hair Clipper retails for anything between $25 and $35 and also comes with a lifetime warranty. however, it must be noted that the warranty is of a limited nature as it does not appear to cover the things they show off, like drops and running it over so that is pretty pointless marketing. Notwithstanding these facts, the Remington Virtually Indestructible Barbershop Clipper is a great home use clipper set at a decent price. There are cheaper options than the Remington HC5850, but if you compare it to a similarly priced set from Wahl or Conair, it is pretty close. The remington #HC5850 is a quality unit that will last and cut hair effectively over time. The Remington Virtually Indestructible hair clipper is great for those who cut their own hair. It provides a quick and easy way to create professional looking haircuts. The high-impact polycarbonate casing, heavy-duty rubber grip, and 8-foot industrial power cord which will stand up to many years of haircuts. Rubber surface makes it easy to hold. Easy to achieve various length settings. Rubbery surface of the clipper attracts hair. Follow us on Twitter for more information and tips. Become our chum on Facebook and explore our Pinterest boards. I am taking music as a GCSE, and I need help! I can’t get an acoustic kit because of where I live and size etc. My options are an electronic kit or a practice kit and I don’t know which one to get. Which ones better, and is a practice kit just practice pads on a frame? I will be practicing at school to on an acoustic kit also. Please help ASAP! Also what kits would you suggest?